Members of our unit occasionally give talks to local schools. Information and pictures of such events are listed here. Michael's photographs of Itohboshou, which is a kind of banana used as a raw material for Bashofu (Basho cloth), were featured in an article published in The Asahi Shimbun. Bashofu is a traditional Okinawan fabric that was woven as far back as 1429. OIST will also be displaying a Bashofu exhibit in the tunnel from 8/27-9/22. Come check it out! OIST Community Relations organized another special tour for 50 elementary school kids to visit OIST and learn what it's like to be a scientist. This year, we made rainbows with the kids, teaching them basic principles of refraction, dispersion, and diffraction. The kids loved making rainbows through their rainbow peephole (diffraction gratings)! 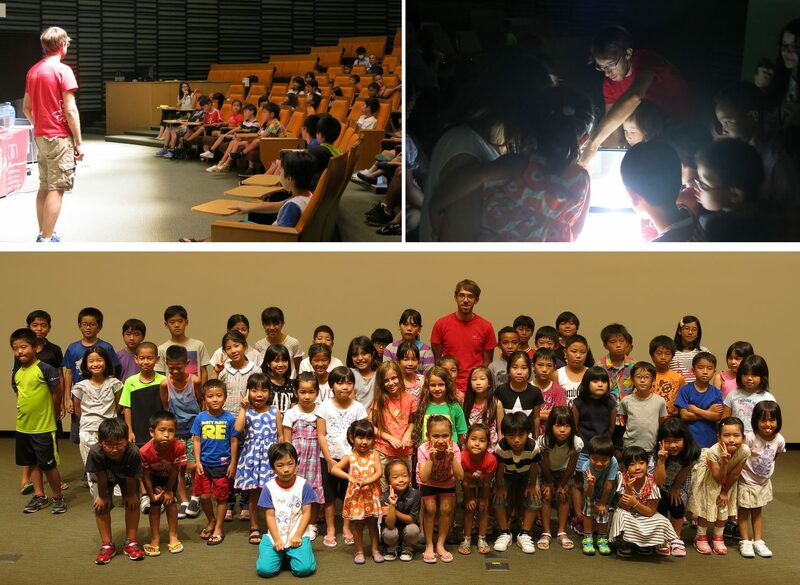 OIST, in collaboration with Onna Village Office, organized a summer school of science for children living in the village or whose parents work at OIST. Along with the OSA student chapter, we taught kids about the science of light, focusing on reflection, refraction, and colors. The kids really enjoyed seeing light bend through glass and seeing rainbows form through prisms! OIST Community Relations organized a special tour for 50 elementary school kids to visit OIST and learn what it's like to be a scientist. We discussed the scientific method, and applied the scientific method to design an experiment to answer the question, "Why is the sky blue?". The kids learned about light scattering and how it is responsible for the blue sky and the red sunset. Remember, kids, never stop asking questions! OIST Community Relations had a booth set up at the Unna Matsuri in Onna, where we helped kids make moving slime. The kids had fun mixing together the safe chemicals to make colorful slime, and they loved getting their hands slimy and playing with the magnets to make the slime move. They also got to become scientists by wearing lab coats and goggles and practice pipetting! Julien visited AMICUS International School for a career fair and gave talks about being a scientist and his research at OIST. 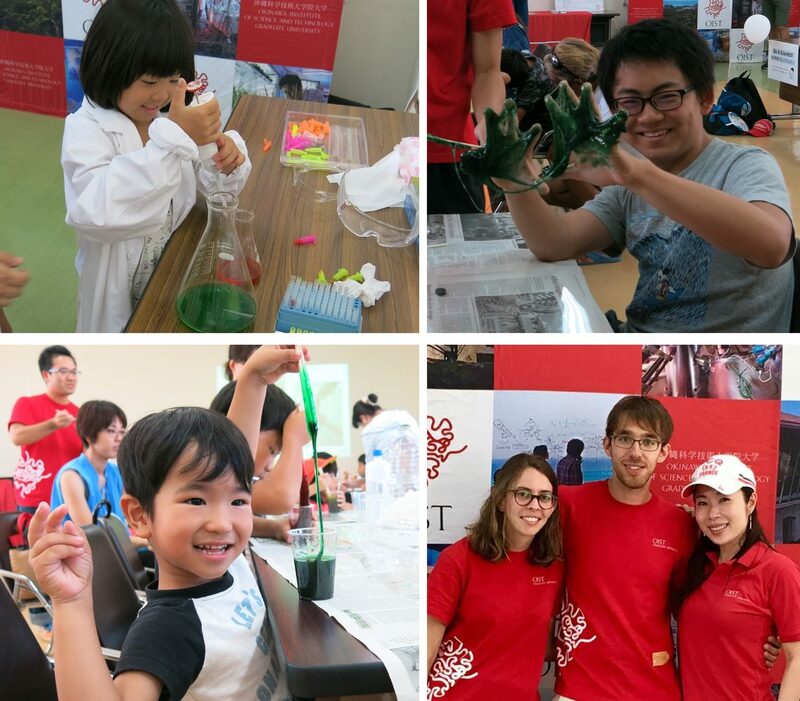 The CDC at OIST and the kindergarten classes from Bob Hope Elementary came to OIST for some science demonstrations. We discussed the differences between solids, liquids and gases, and how we can change between these states by changing the temperature. Using liquid nitrogen we shrunk a balloon of gas and watched it expand again as the temperature rose, but I think they mostly enjoyed the part where we froze some cabbage and smashed it on the floor! 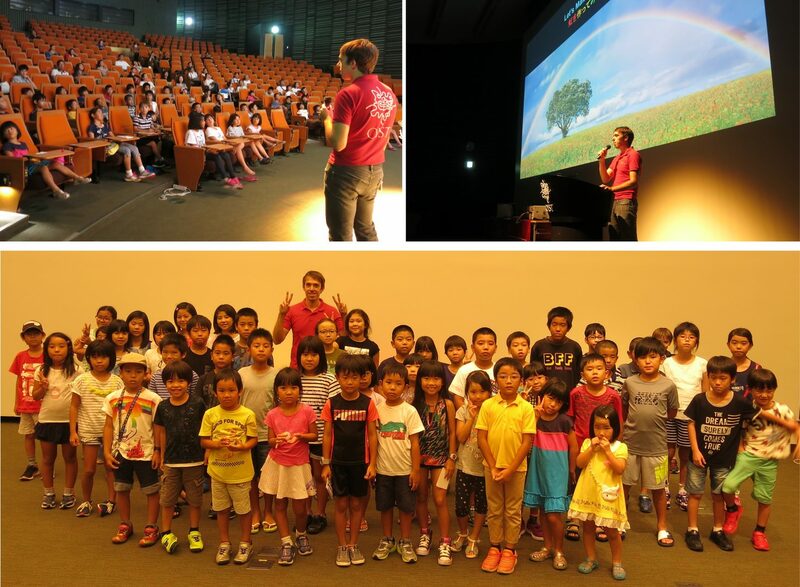 In keeping with OIST’s mission to promote science to the people of Okinawa, during the open day of 2014 we were able to give an hour long lecture to the general public. From star formation to carbon allotropes and femtosecond spectroscopy, we covered a variety of different topics. 200 high school students visited OIST interested in both what we do here and why it is interesting. We discussed science in nature, such as the bright colours of a thin butterfly wing, as well as some recent scientific achievements like negative refractive index. We also explained the enormous power of our amplified laser, hopefully we have inspired the next generation of scientists! OIST was invited to give a presentation at the Bob Hope Elementary School during their science week. With approximately 600 children, aged between 5 and 8 years old, we discussed different sources and colours of light. We also found that all the colours of the rainbow are hiding inside white light, and with a simple prism we can see them all! Keshav visited a local junior high school in Onna Village to talk about our powerful lasers that can be used to cut through almost anything! He also talked about his experiences in high school in his home country of India. The kids loved hearing about lasers, and asked Keshav what is the most exciting aspect of conducting research, to which he responded, "It is fun to be surrounded by and play with research instruments all the time." Page last updated on August 27, 2018 (CP).